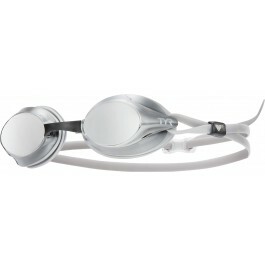 Go fast or go home with TYR Velocity Mirrored Adult Goggles. Constructed with a low profile design, the LGVM boasts a sleek, streamlined fit that ensures minimal drag and increased speed. In addition, all Velocity swimming goggles feature silicone cushion gaskets and a double silicone head strap for a comfortable, secure fit. With a wide peripheral range and 3 nosebridge size options, the LGVM is an ideal race and training goggle for both male and female athletes. This is the first pair of goggles I've purchased with peripheral sides rather than wider eye range. I think I like this feature. This pair also came with a wider set nose piece. I have trouble adjusting individual sized nose pieces. I've worn them only a few times and the strap of this style is the only thing I would change. My preference is the side-adjustable Special Ops, than the one long strap with back adjust. I also prefer mirrored lens on this item. Now, if I could only figure out how to purchase a pair to fit over Rx glasses. The goggles fit very well and don't leak. Ive had 4 pairs of these over the last 5 yrs and the only reason I had to buy more than 1 pair is because I keep giving them away to friends who have had trouble with their goggles and every time they loved them and continue to thank me to this day. I had one pair that I wore for 4 years and then gave them away to my swimming buddy who still wears them and thanks me nearly every time I see him. Q: Is there a “right side up” with these and how can you tell? A: There is a TYR logo on the side, TYR should be upright. Q: Hi! I want to buy the TYR Velocity Racing Metallized Goggle in Gold/Mint/Grey, but on the page that I'm going to buy, they only sell one size and not an adult. What is the difference between a size and an adult? Because it is the first time I would buy glasses. A: Velocity is an adult goggle. Q: Is there a difference in "shading" between the Metalized Blue and the Sky Blue as my current one is too dark to swim in the evenings. A: All of our Mirrored goggles will be on the darker side. Q: How do you exchhnge the adjustable nosebridges? What is the purpose of the black sliding clips on the adjustable straps? A: Thank you for your inquiry. By pulling the current nosebridge out from either end, the new nosebridge will pop right into place in the lenses. Q: Are these recommended for triathlons? A: Thank you for your inquiry. Velocity Goggles most certainly can be worn for triathlon use. Choice in goggle is a matter of personal preference, however our most popular triathlon goggles are the Special Ops 2.0 and Nest Pro Goggles. Customer Service is our top priority. If you have any additional questions, or require additional assistance with goggle selection, please feel free to contact us via Live Chat or telephone (1-800-252-7878). We offer Live Support Mon-Fri 9AM-5PM PST. Constructed with a Low Profile design, the Velocity Mirrored Goggles provide a streamlined fit for minimal drag and increased speed in the water. Wide peripheral range allows for optimal sighting, making it a perfect choice for open water.